Guangdong in southern China was struggling with an overpopulation problem at that time, and the very real prospect of starvation prompted some traditionally home loving men to set sail for the gold fields of California, Australia and finally New Zealand. The 12 Chinese miners who arrived in New Zealand in 1865 were soon followed by thousands more. Having been raised in villages where self-sufficiency was the norm, these men planted vegetables for their own consumption and sold the surplus. Before long, Chinese gardeners were supplying fresh vegetables to all the goldfields. When the gold ran out, many Chinese miners moved to urban areas, leased land from Māori and European settlers, and took up market gardening. Those who saved enough money to return to China often married and had a family before returning alone to New Zealand. They were not allowed to bring their wife or young children, but sons who were old enough to work in the vege fields were allowed to come. Predictably, the men staved off loneliness by forming tight-knit community groups. They also sought solace in gambling and opium. In their gardens, the men adapted the traditional farming methods of their villages to New Zealand conditions. With the help of the lunar calendar – used to determine the best time to sow a variety of veges – they grew several crops a year using a strict pattern of rotation. These hard-working men learned to magic crops out of the meanest patch of land. They worked the soil to a fine tilth, lavishly applying whatever manure they could find – horse, pig and fish all did the trick. Consistent and generous watering was also crucial to success. When sites were exposed, they made windbreaks by lining fences with thistle stalks or branches of mānuka. When rabbits started burrowing under the walls of huts and fences, they set vertical slabs of stone into the soil. In low-lying fields ditches were used for both drainage and irrigation. In wet areas, the men used water treadmills to pump surface water into the open drains that lined the streets. Although most of these gardeners slogged away with little help, the better off bought horses to pull their ploughs and harrows. And by the 1930s, some gardeners were replacing their Clydesdales with Fordson tractors. The gardeners grew Asian greens for their own consumption, plus the vegetables that were popular in European households. Potatoes, cauliflowers, lettuces, peas, carrots, cabbages, turnips, corn, spinach, silverbeet, spring onions, white turnips and parsnips were all common. Gooseberries and strawberries were also grown. One of the best-known gardeners of the West Coast’s Grey Valley was Ah Long, who had a large garden in Ahaura from the early 1900s. He was said to have grown “rows and rows” of scarlet runner beans, cabbages, cucumbers and “all other vegetables”. He also had a piggery and a duck pond, and kept horses for delivering provisions to miners and vegetables to the local sawmilling camps, according to a Presbyterian minister, missionary and writer of the time, Alexander Don, who had compiled a unique record called “Roll of Chinese” in New Zealand from 1883 to 1913. Vegetables were hawked around, usually by a single person doing the rounds of local dwellings carrying two baskets slung from a pole. Some gardeners took their produce around by horse and cart. 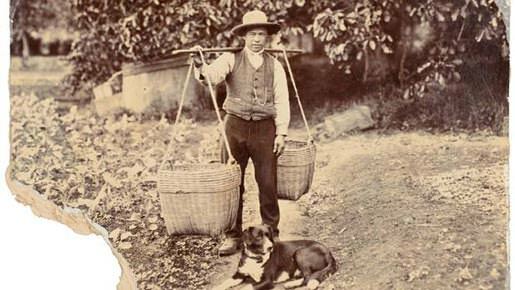 Chinese market gardeners often also supplied their produce to Chinese family-run greengrocers, local markets and occasionally to two of the smaller auction houses in existence at the time. When the last Chinese fruit and vegetable shop on the West Coast closed in 1978, it was almost exactly 100 years since the children’s great-grandfather, Yen Ting Jan, arrived on the West Coast during the 1870s. 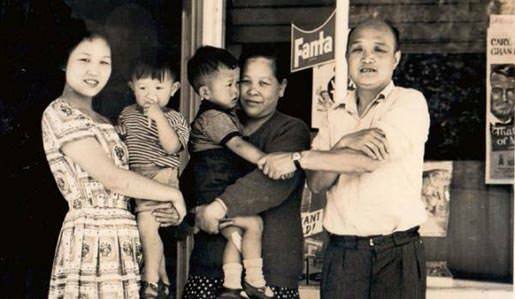 The Jan family stand outside the On Lee fruit shop in Reefton ca 1965. Photo from Peter Jan Collection. The Chinese looked different, dressed differently, ate different food, spoke a different language and – despite Alexander Don’s best efforts – had a different religion from most other immigrant New Zealanders. Newspapers often voiced society’s disapproval of Chinese with articles on their drunkenness, gambling, opium smoking and assaults. Fortunately, others celebrated the wonderful fireworks displays and wrote of the many prizes Chinese gardeners won in horticultural shows. Chinese herbal remedies were also popular during the gold rush. The decade-long economic depression, which started in 1879, made many Europeans fear that Chinese workers were taking their jobs. However, although many European growers resented the Chinese monopoly of the market garden industry for fear that it was depriving white New Zealanders of the opportunity to make money from selling vegetables, few Europeans really wanted to do the work. Yet, it was not uncommon for Chinese gardeners to be fined for working in their gardens on a Sunday. It was technically illegal for anyone to “work at their calling” on this supposed day of rest, but no allowance was made for the gardeners’ need to harvest in preparation for the Monday market, or for the fact they weren’t Christians so, strictly speaking, didn’t have to abstain from work on Sunday! When temporary entry permits were introduced in 1920, the annual quota of 100 Chinese immigrants included 25 permits for women. This was the first time that wives were able to join their husbands. After Japan invaded China in the 1930s it was agreed that, as a humanitarian gesture, wives and children could join their husbands for two years. Chinese men who had toiled away alone in their market gardens suddenly became family men. Subsequent decades saw increased numbers of Chinese women and children arriving in New Zealand. During World War Two, market gardening became a crucial component of the war effort. Though they were still officially classified as aliens, Chinese gardeners upped their vegetable production dramatically to provide sufficient food for the troops. Prejudice fell away as white New Zealanders saw the Chinese community working to ensure that there was enough food. China’s fight against the Japanese also influenced opinion. The Chinese gardeners were now viewed as hard-working patriots. This led to the poll tax being repealed – at last – in 1944. There was no letup in the hard work even after the war. It was not uncommon for gardeners to work 12 to 15 hours a day during the warmer months. For many it was a family affair, with children expected to pitch in after school, on weekends and in their holidays. However, most parents wanted their children to have professional careers, so increasingly prioritised study over tilling the soil and harvesting cabbages. Nevertheless, as the years passed, the market gardeners grew an increasingly diverse range of crops, including greenhouse crops and a greater variety of Chinese vegetables. The bulk of the produce was sold to greengrocers (almost always Chinese) at auction, but roadside stalls were also a valuable outlet. 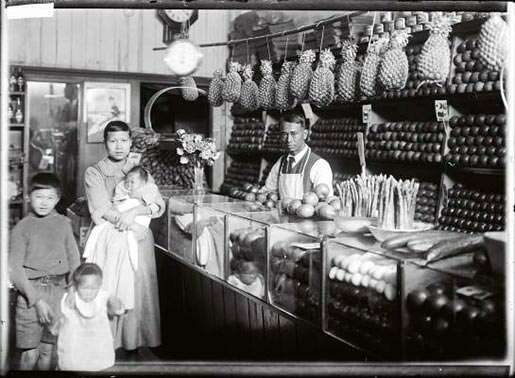 A Chinese greengrocer and his family in their shop, probably early 20th century. Among the fruit and vegetables on sale are asparagus, apples, cucumbers and pineapples. Photo by JN Taylor for the Weekly Press. During these post-war decades, Chinese gardeners produced over 70 per cent of the green vegetables in New Zealand, and probably much the same of other crops. In the 1990s, the rapid growth of supermarkets led to the decline of both the auction system and the neighbourhood fruit and vegetable shops. The small family-run gardens became less and less profitable. As the younger generation increasingly chose city life over the family business, the era of the family-run Chinese market garden was coming to a close. But small, family-run market gardens have not been totally lost. A surge in demand for organic vegetables has helped, while farmers’ markets have provided a valuable outlet for garden produce. New migrants’ appetites have fuelled the growth of Asian vegetables such as foo gwa (bitter melon), see gwa (loofah) and ong choy (water spinach). The Fongs’ 300 hectares (tended by a staff of 50) is typical of the trend. Noting that their business, The Fresh Grower, specialises in niche lines such as Baby White Pak Choy, Bellaverde (sweet-stemmed broccoli) and baby leaf salad mixes, Alan says. Written with additional references from Julia Bradshaw’s Golden Prospects: Chinese on the West Coast of New Zealand, edited by West Coast Historical & Mechanical Society Inc, Greymouth (2009).